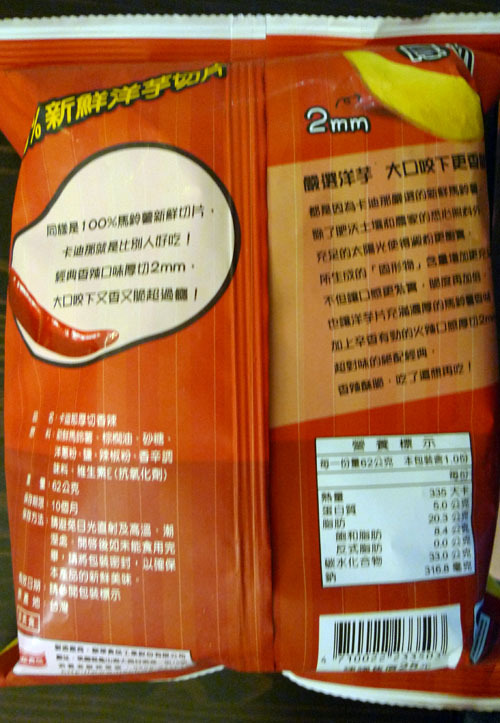 I’ve been happily munching away at bags of taiwanese potato chips for the past few months. Here’s the first lucky bag to be reviewed a Cadina’s Hot & Spicy Potato Chips. 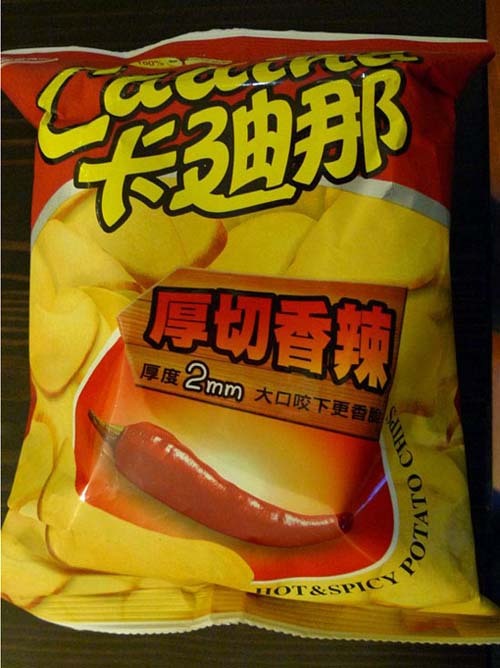 The packaging is eye catching with yellow chips contrasting with red, a wooden arrow proclaiming it’s spicy name and a bright red pepper underneath. The color scheme reminds me of a certain popular fast fewd chain where a terrifying clown sells us burgers and fries, and the pepper reminds me of a southwest “casual food chain” that specializes in build your own burritos. Can the chips that are within this bag live up to it’s in your face packaging? Back of the bag, sorry blurry. Here is some nutrition information that I cannot translate for you. I’m sure it just says it’s delicious. Oh, the 2mm refers to the thickness of the chips. It turns out this is a great thickness for potato chips. 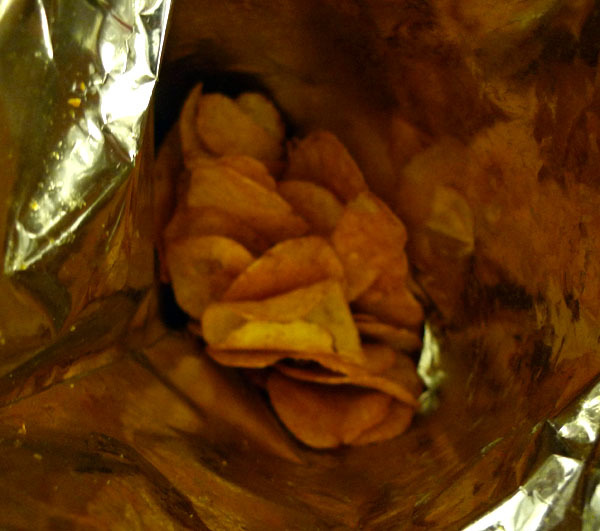 Looking inside an opened bag, you can see there’s only about 1/4 the bag full of chips. This is incredibly disappointing. What the hell Cadina? Sadly this is the case with almost all Cadina brand chips. This bag cost about 1$ so it’s not a great value at all. The chip is a perfect 2mm thick, it really is the magic thickness. It’s a little meatier of a crunch than chips I’m used to such as lays or kettle chips. It’s a bit more spicy than american spicy chips. It’s a pretty delicious chip with the perfect amount of savory and an added kick. 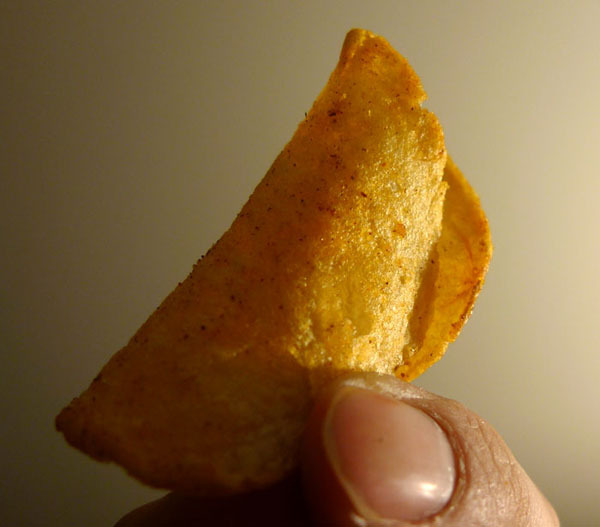 The chip isn’t incredibly oily, and only if you eat the whole bag will you start feeling the grease. There’s just not that many in the bag though.